2. A fascinating find was that a large number of presidents and prime ministers lost a parent before the age of 15. 3. Disadvantages such as disagreeableness (Sherlock Holmes anyone?) and dyslexia are actually turned into great unique advantages. 4. Small class sizes don’t matter. *Personally, I disagree with this one as a parent and a former teacher. 5. The discussion regarding the Three Strikes law in California is really interesting. I had heard of the law, but never paid close attention to the results. 6. The cure for cancer through finding a cure for childhood leukemia is very thought provoking. Reminds me of “House” or Holmes in “Elementary” where two disagreeable men find the answers to questions nobody else can find because these men don’t follow society’s rules. How did Jay Freireich find a cure for childhood leukemia? He did what nobody else dreamed of doing… and then when he was told no, he pushed and pushed and found a way. Using drugs to kill children’s cells was crazy back then. Combining FOUR drugs to kill cancer cells in children? Even crazier. But now? Using combinations of drugs is done all the time on cancer without a second thought. Craft: I thought this card was really fun to make and very pretty. The kids can use their fingerprints for the snowman or you could do it yourself. No $20 stamps required! It could be a “Thank You” card, “Merry Christmas” card, “Get Well Soon” card… or anything you like. 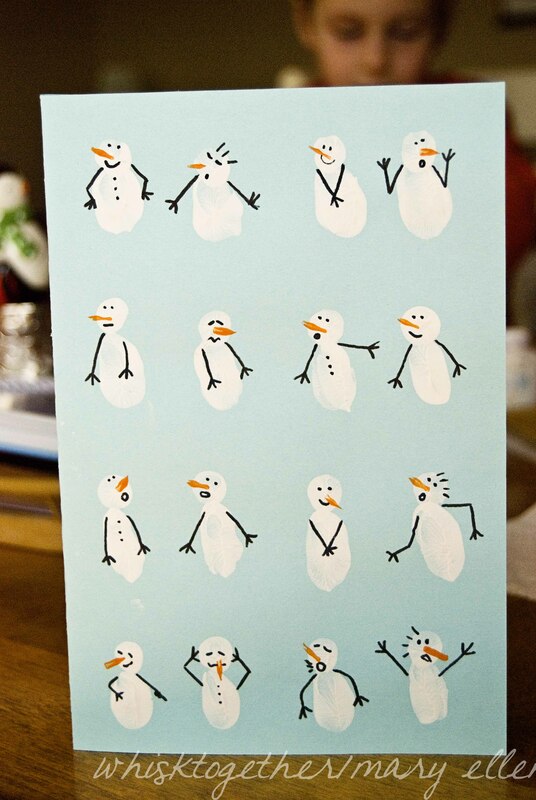 We had all the supplies at home for this simple, but cute card. 1. Put your thumb in the white paint gently. You may want to do a trial run on a scrap piece of paper first to get the hang of how much paint and pressure to put on the final card. 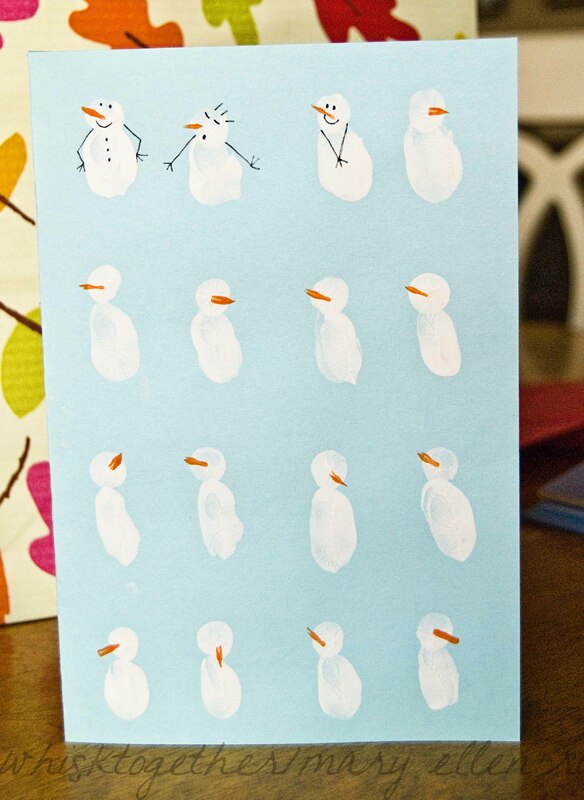 Make rows of snowman bodies as shown on the card. 2. Do the same dipping technique with your pointer finger or middle finger and make the heads. 3. Now, cut a fold a small piece of thin cardboard. While folded in half, dip it lightly into the orange paint and make the noses. Again, you may want to try scrap paper first. 5. Using a black felt or uniball black pen, draw eyes, noses, mouths, arms, buttons, etc. 6. 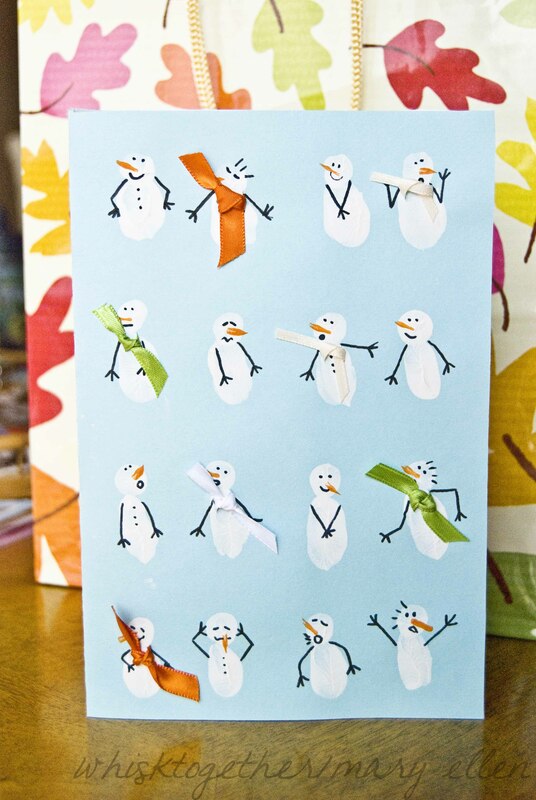 Using an X-acto knife or open pair of scissors, cut slits on either side of the snowmen’s necks randomly throughout the page. 7. Take a piece of ribbon and push it through the hole. Tie both ends. You want to make it too long at first. Pushing ribbon through paper generally frays the edges and you can always trim later. Ta dah! Of course, you could add hats to the snowmen or tiny buttons for embellishments, etc. 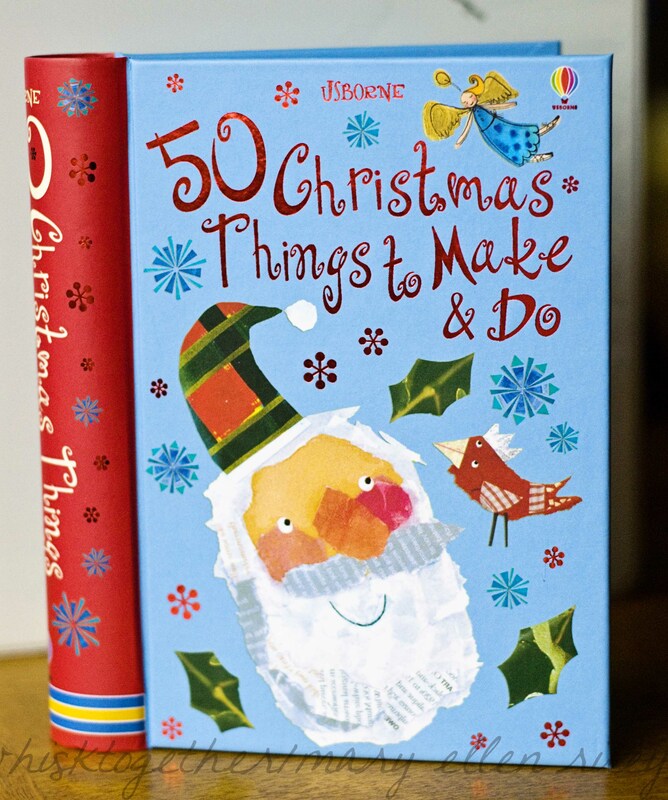 Craft inspired by Usborne’s “50 Christmas Things to Make and Do” which is my favorite craft book. 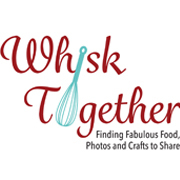 This company does an excellent job at presenting crafts I would actually make with my kids and uses a few household items without having to run to the store for something. Love Usborne books!